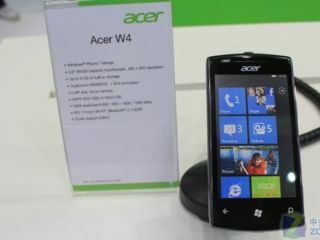 Acer has shown off a prototype of its first Windows Phone 7 handset, known as the Acer W4. Along with giving the W4 its first photo opportunity, Acer revealed a few juicy spec-related titbits for its Mango-running handset. It will offer a 3.6-inch WVGA capacitive touchscreen with 480x800 screen resolution, a 1GHz Qualcomm MSM 8255 processor and 8GB of storage. For connectivity, you're looking at Wi-Fi, quad-band 3G, Wi-Fi and Bluetooth 2.1. It doesn't look as though Acer's stuck a front-facing camera on there, but the rear-mounted snapper is a 5MP affair, complete with autofocus. Given that it is set to launch with Windows Phone 7 Mango, we don't anticipate the Acer W4 UK release date coming in any time before the end of summer.